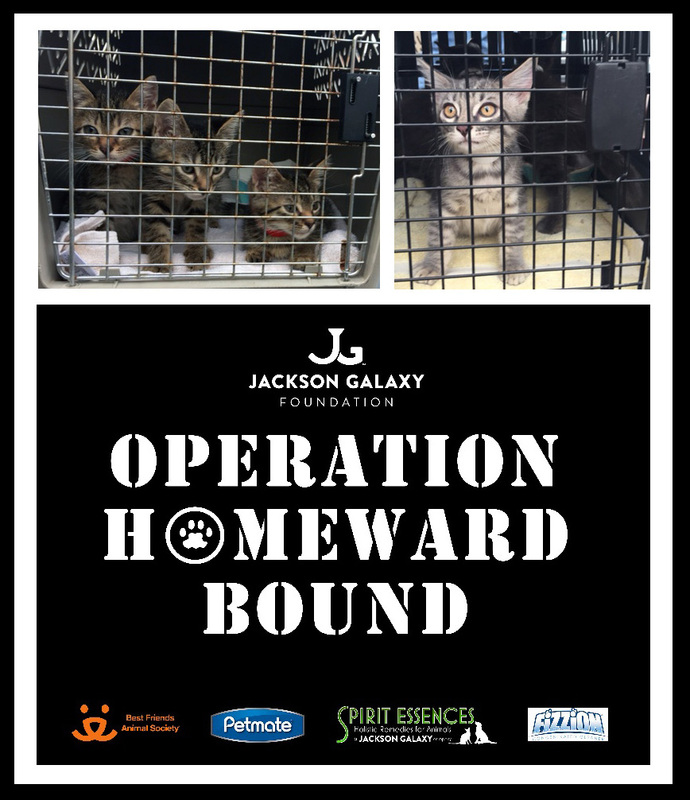 Like many of you, I am a HUGE fan of Jackson Galaxy and the work of the Jackson Galaxy Foundation (JGF) to improve the lives of animals at risk by transforming the places they live and supporting those who care for them. So when I heard about fellow Chicagoan and animal advocate Ollie Davidson’s creative efforts to raise funds for JGF, I knew I had to help spread the word. 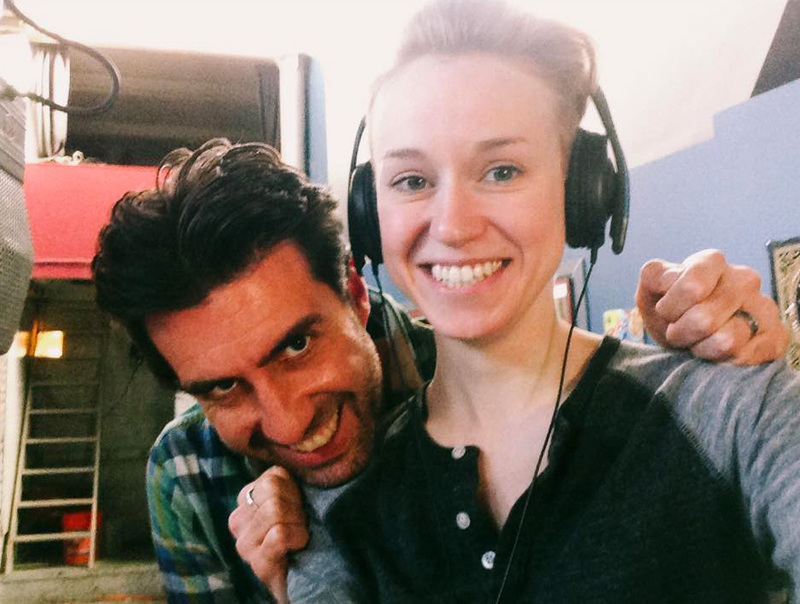 Ollie and co-creator Natalie Alms, AKA Almond&Olive, are a folk music duo in the midst of recording their debut CD. 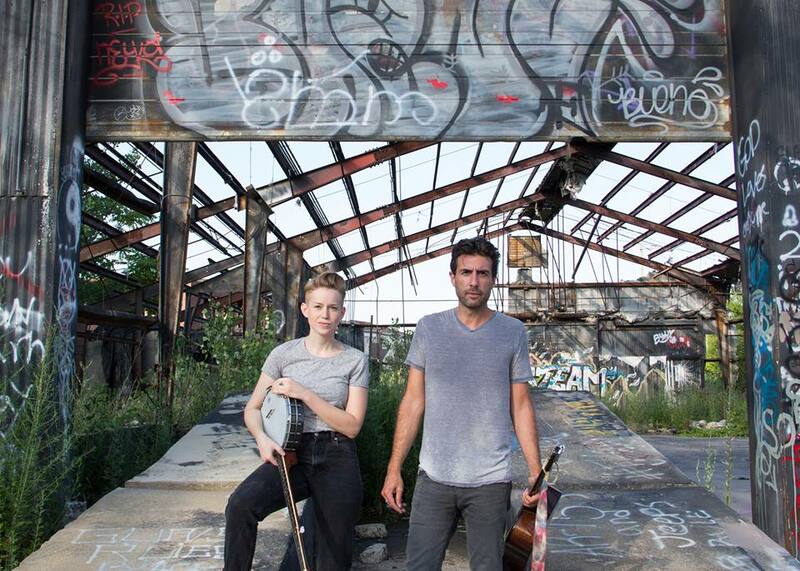 They met while working at an animal welfare organization and soon realized in addition to their love of animals, they also shared a love of creating music. A few weeks later, they had written a handful of songs and decided to form a duo. Once recording is completed, a portion of the sales will be donated to the Jackson Galaxy Foundation to help animal shelters across the country meet their goals and dreams. “Not only are we creating something amazing, but with our creation we will be also giving back,” Ollie told me. Specifically, this creative partnership will support JGF programs like Cat Pawsitive, positive-reinforcement clicker training program that enriches the lives of cats in shelters, empowers shelter staff, volunteers and cats with new skills, and ultimately, improves adoptability. Pepper gives her trainer a feline high five! Shelters can be crazy stressful for cats. The sights, sounds and smells can make even the friendliest of felines withdraw and shut down. 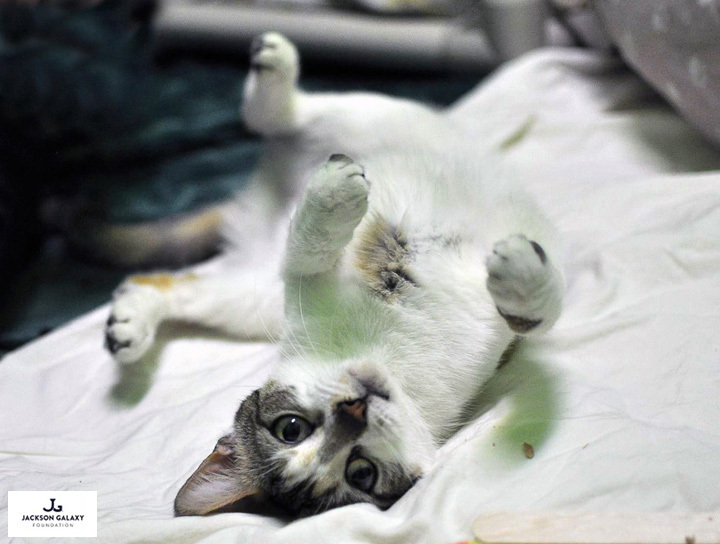 Stress can also increase anxiety and fear-based aggression, leave them more vulnerable to upper respiratory infection and other health issues, and contribute to many perfectly wonderful cats being labeled less “adoptable”. 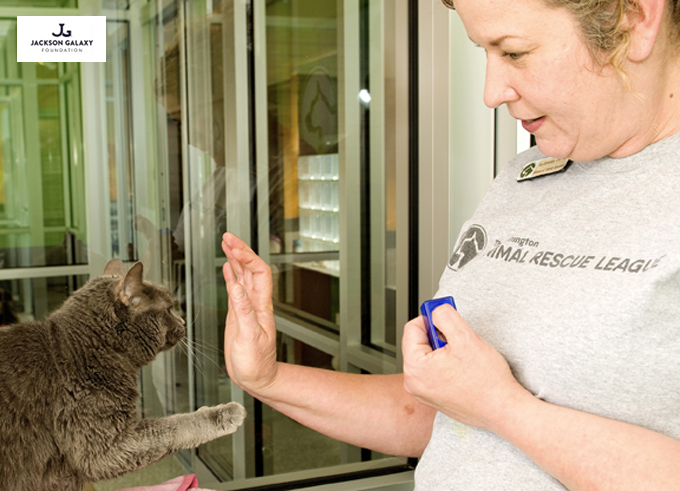 Cat Pawsitive helps shy cats find the courage to greet adopters, teaches feisty felines some manners, and helps all participating cats become more adoptable – with many learning to increase their odds by giving high fives to potential adopters. Mau Mau, a Cat Pawsitive success story! 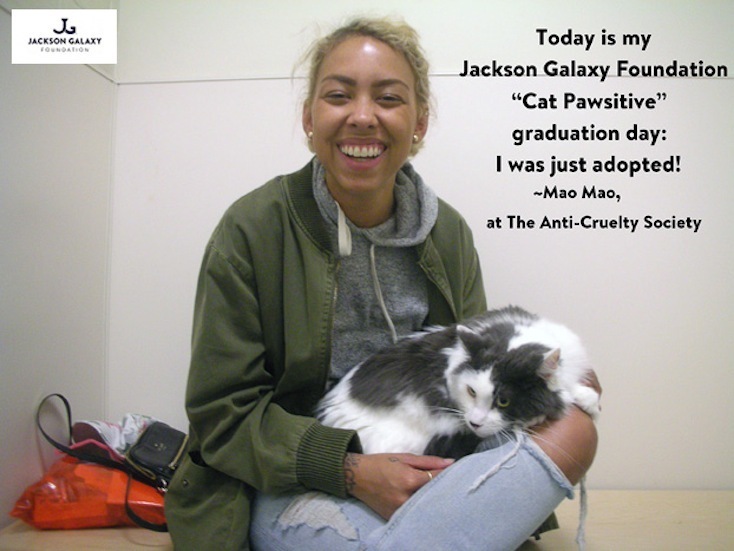 The Jackson Galaxy Foundation selected nine shelters from across the country to participate in the inaugural class of the Cat Pawsitive initiative. Cat Pawsitive shelters participated in training webinars with JGF feline behavior experts, received JGF training tools, handouts, and videos as well as national exposure through the social media outlets of Jackson Galaxy and the foundation. JGF is just over a year old and Executive Director Sandy Monterose reports that the foundation is just getting started and has some amazing initiatives waiting in the wings. Most recently, Jackson and his wife, Minoo, celebrated their wedding anniversary by transporting dozens of cats and kittens 1,000 miles from Best Friends Los Angeles, currently full to capacity with kitties, to the Humane Society of Boulder Valley in Boulder, Colorado where there is a kitten shortage due to high adoptions! Please join me in supporting Almond&Olive and help make their dream a reality while also supporting the life-saving work of the Jackson Galaxy Foundation. You can learn more about their mission to help shelter animals, listen to some of their music, and support their Kickstarter campaign here. If you aren’t in a position to donate, please share! You can also follow Almond&Olive on Facebook and Instagram and JGF on Facebook, Instagram, and Twitter. shared :o) yay for almond&olive and I wish them all the power for their work. I'm impressed that a kitty can give high fives… that's just great! Sounds like a great organization to help all the kitties that need homes. JGF is great Marg – they really make a difference in the lives of shelter animals and animals at risk! This sounds like such a wonderful joint effort between Almond & Olive and the Jackson Galaxy Foundation. I love what they're doing. I also love folk music, so I will definitely be checking out their stuff. Thank you so much for sharing this with us! Thanks for checking us out! Jackson and his team have been so supportive – very happy to help them! For sure – JGF is the best! Thanks Cathy! Jackson and JGF are really doing amazing work in the community! That really is most wonderful and we love humans like that! Thank you for reporting about this. I have seen Jackson Galaxy products but never knew they benefited cats. I am going to pay more attention to them. I am sure your post has helped educated a lot of people. Most definitely – the Daily Pip is a great blog and full of really helpful tips, including spreading the word about the amazing work JGF has been doing! Paws up to Almond & Olive for what they are doing to help cats. We've been great friends since the start – we'll continue to make beautiful music and give back! Love the hugs – thanks M&M!